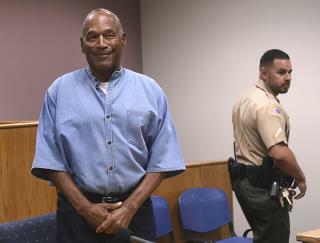 (Newser) – OJ Simpson could be released on parole as soon as Monday in Las Vegas under a plan being finalized by Nevada officials, per the AP. The process culminating in freedom for the former football player, actor, and TV pitchman is in motion, but must be approved and documents must be signed, state Department of Corrections spokeswoman Brooke Keast said. Meanwhile, the 70-year-old Simpson remains at Lovelock Correctional Center in northern Nevada awaiting transfer to High Desert State Prison outside Las Vegas, where he would be freed. O. J. can swap places with Donald and his Swamp billionaire cabinet. His first stop is locating a knife. His next stop is Kris Jenner's house. The man knows what he's good at. Maybe it will be in time to stick him in the coffin with Hugh. Dirt to dirt.